IMT Ghaziabad, India’s premier management school with a distinct focus on grooming Leadership through Innovation, Execution and Social Responsibility, announced the commencement of the 2017–19 batch of Post Graduate Diploma in Management (PGDM) and the Post Graduate Diploma in Management – Dual Country Programme (PGDM–DCP). This is the 38th batch of PGDM and the 8th batch of PGDM–DCP. Following the registration process on June 6, 2017, the new cohorts are currently undergoing a month-long Orientation and Foundation module which would apprise them about the institute’s philosophy, curriculum & pedagogy. The diversity of the PGDM 2017–19 batch has improved significantly – it comprises more than 32 percent female students (as compared to 19 percent in 2016-18) and 27 percent students from diverse academic backgrounds other than engineering (as compared to 21 percent in 2016-18). About 67 percent of the batch has prior work experience (marginally up from 65 percent in 2016-18) with the average work experience of the batch going up to 15 months (from 14 months in 2016-18). The cohort represents 24 states of India. The PGDM–DCP 2017–19 batch has 16 percent female students (as compared to 15 percent in 2016-18). 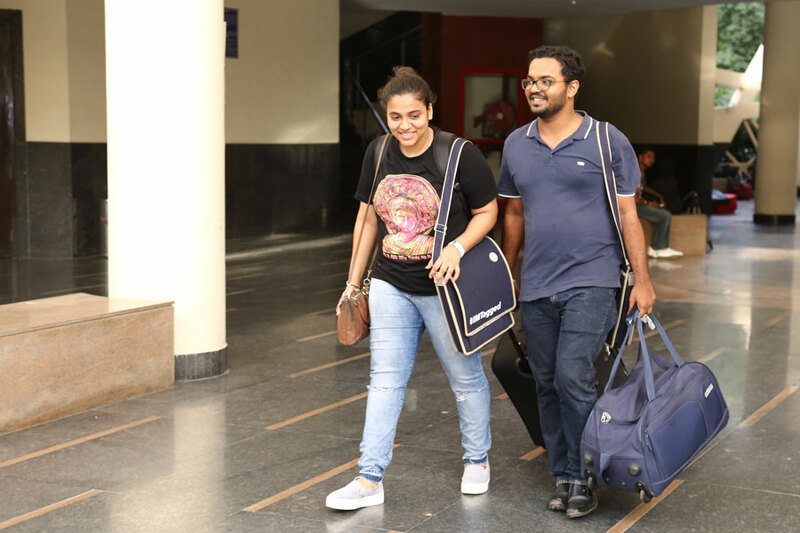 More than 55 percent of the batch has prior work experience (as compared to 45 percent in 2016-18) with the average work experience of the batch going up to 12 months (from 8 months in 2016-18). The cohort represents 20 states of India. The average age of students across both the programmes is 23 years. The month-long Orientation and Foundation module took off on Tuesday, June 6, 2017, with the ceremonial lamp lighting and prayers, followed by faculty introduction. Dr. Reema Khurana, Programme Chairperson – PGDM, introduced the programme to the new batch of students. Introducing the students with the Programme, Dr. Reema Khurana said, “In sync with the changing needs of business and to remain in context to the evolving global economies, IMT Ghaziabad has always strived to be current. We had a programme rejig last year; we benchmarked all our courses against best learning institutions in India and abroad, and thus emerged the Programme Architecture for 2017-19”. “The philosophy of Grooming Leadership through Innovation, Execution and Social Responsibility is reflected in courses like Design Thinking, Entrepreneurship, Sustainability and Social Responsibility. The aspect of Knowing, Doing and Being wherein ‘Student Managers’ would not only learn through classroom lectures but will actually undertake work to learn ‘Execution’ through Organisation Based Projects. A number of field-based and industry interfacing pedagogies have also been adopted for this purpose.” she added. Keeping with the IMT tradition, the inaugural ceremony also witnessed a pragmatic and inspiring keynote address by the Chief Guest Mr. Mussarat Hussain, General Manager – Education & Training, Maruti Suzuki India Limited. Citing Maruti-Suzuki’s philosophy of building talent rather than buying it, he stressed on grooming leadership from within and hence, the need for continual and rigorous exposure to right training at all levels. He candidly put forth that innovation and proper execution of the strategy, and adoption to change, are the keys to excelling in any industry one grows. Mr Hussain also emphasised on developing right attitude, aptitude and to be culturally-fit for an organisation. This was followed by an open question and answer session for students with the Director, the Dean-Academics, the Programme Chair, and the Chief Guest. Dr Atish further added that the Institute had received a sanction for additional 120 seats across programmes this year from AICTE. Going forward, the Institute intends to launch programmes specifically directed towards enhancing opportunities for international placements.